1899 Tesla gave this interview which has rarely ever been published for over 100 years. In it Tesla’s pulls no punches and reveals the great conspiracy of science that was well under way, the suppress the ether and the introduce a new fake science to conceal it as well as suppress the work of Tesla Himself. Once, in 1899, Nikola Tesla had an interview with a certain journalist John Smith, when Tesla said “Everything is the Light“. In one of its rays is the fate of nations, each nation has its own ray in that great light source, which we see as the Sun. In this interview this greatest inventor and seer of modern time unravels a new vision of humanity which we, the light warriors of the first and the last hour have created a century later. A must read for every Ascended Master from the PAT.Part of this interview is dedicated to Tesla’s critics on Einstein’s theory of relativity that discards the ether as energy. I have proved in the new Theory of the Universal Law why Einstein’s theory of relativity is entirely wrong and why there is no vacuum (void), and that everything is energy. Thus I confirm Tesla’s ideas as expressed in this interview. George, May 7, 2015 Journalist: Mr. Tesla, you have gained the glory of the man who got involved in the cosmic processes. Who are you, Mr. Tesla? Tesla: It is a right question, Mr. Smith, and I will try to give you the right answer to it. Journalist: Some say you’re from the country of Croatia, from the area called Lika, where together with the people are growing trees, rocks and starry sky. They say that your home village is named after the mountain flowers, and that the house, where you were born, is next to the forest and the church. Tesla: Really, all it true. I’m proud of my Serbian origin and my Croatian homeland. 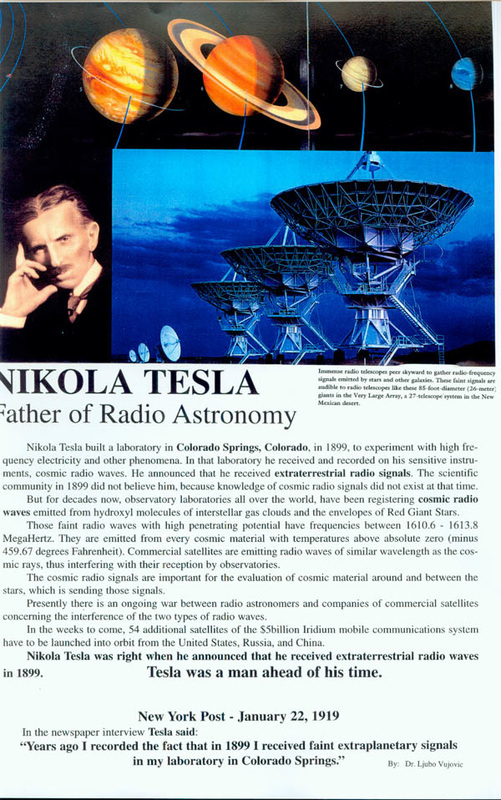 Journalist: Futurists say that the Twenty-and Twenty First Century was born in head of Nikola Tesla. They celebrate conversely magnetic field and sing hymns to Inductions engine. Their creator was called the hunter who caught the light in his net from the depths of the earth, and the warrior who captured fire from heaven. Father of alternating current will make the Physics and Chemistry dominate half the world. Industry will proclaim him as their supreme saint, a banker for the largest benefactors. In the laboratory of Nikola Tesla for the first time is broken atom. There is created a weapon that causes the earthquake vibrations. There are discovered black cosmic rays. Five races will pray to him in the Temple of the future, because they had taught a great secret that Empedocles elements can be watered with the life forces from the ethers. Tesla: Yes, these are some of my most important discoveries. I’m a defeated man. I have not accomplished the greatest thing I could. Journalist: What is it, Mr. Tesla? Tesla: I wanted to illuminate the whole earth. There is enough electricity to become a second sun. Light would appear around the equator, as a ring around Saturn. Mankind is not ready for the great and good. In Colorado Springs I soaked the earth by electricity. Also we can water the other energies, such as positive mental energy. They are in the music of Bach or Mozart, or in the verses of great poets. In the Earth’s interior, there are energy of Joy, Peace and Love. Their expressions are a flower that grows from the Earth, the food we get out of her and everything that makes man’s homeland. I’ve spent years looking for the way that this energy could influence people. The beauty and the scent of roses can be used as a medicine and the sun rays as a food. Life has an infinite number of forms, and the duty of scientists is to find them in every form of matter. Three things are essential in this. All that I do is a search for them. I know I will not find them, but I will not give up on them. Journalist: What are these things? Tesla: One issue is food. What a stellar or terrestrial energy to feed the hungry on Earth? With what wine watered all thirsty, so that they can cheer in their heart and understand that they are Gods? Another thing is to destroy the power of evil and suffering in which man’s life passes! They sometimes occur as an epidemic in the depths of space. In this century, the disease had spread from Earth in the Universe. The third thing is: Is there an excess Light in the Universe? I discovered a star that by all the astronomical and mathematical laws could disappear, and that nothing seems to be modified. This star is in this galaxy. Its light can occur in such density that fits into a sphere smaller than an apple, a heavier than our Solar System. Religions and philosophies teach that man can become the Christ, Buddha and Zoroaster. What I’m trying to prove is wilder, and almost unattainable. This is what to do in the Universe so every being is born as Christ, Buddha or Zoroaster. I know that gravity is prone to everything you need to fly and my intention is not to make flying devices (aircraft or missiles), but teach individual to regain consciousness on his own wings … Further; I am trying to awake the energy contained in the air. There are the main sources of energy. What is considered as empty space is just a manifestation of matter that is not awakened. No empty space on this planet, nor in the Universe.. In black holes, what astronomers talk about, are the most powerful sources of energy and life. Journalist: On the window of your room in hotel “Valdorf-Astoria”, on the thirty-third floor, every morning, the birds arrive. Tesla: A man must be sentimental towards the birds. This is because of their wings. Human had them once, the real and visible! Journalist: You have not stopped flying since those distant days in Smiljan! Tesla: I wanted to fly from the roof and I fell: Children’s calculations could be wrong. Remember, the youth wings have everything in life! Journalist: Have you ever married? It is not known that you have affection for love or for a woman. Photos from the youth show you were handsome man. Tesla: Yes. I did not. There are two views: a lot affection or not at all. The center serves to rejuvenate human race. Women for certain people nurtures and strengthen its vitality and spirit. Being single does the same to other people. I chose that second path. Journalist: Your admirers are complaining that you attacking relativity. The strange is your assertion that the matter has no energy. Everything is imbued with energy, where it is? Tesla: First was energy, then matter. Journalist: Mr. Tesla, it’s like when you said that you were born by your father, and not on you. Tesla: Exactly! What about the birth of the Universe? Matter is created from the original and eternal energy that we know as Light .It shone, and there have been appear star, the planets, man, and everything on the Earth and in the Universe. Matter is an expression of infinite forms of Light, because energy is older than it. There are four laws of Creation. The first is that the source of all the baffling, dark plot that the mind cannot conceive, or mathematics measure. In that plot fit the whole Universe. The second law is spreading a darkness, which is the true nature of Light, from the inexplicable and it’s transformed into the Light. The third law is the necessity of the Light to become a matter of Light. The fourth law is: no beginning and no end; three previous laws always take place and the Creation is eternal. Journalist: In the hostility to the theory of relativity you go so far, that you hold lectures against its Creator at your birthday parties.. Tesla: Remember, it is not curved space, but the human mind which cannot comprehend infinity and eternity! If relativity has been clearly understood by its Creator, he would gain immortality, even yet physically, if he is pleased. I am part of a light, and it is the music. The Light fills my six senses: I see it, hear, feel, smell, touch and think. Thinking of it means my sixth sense. Particles of Light are written note. O bolt of lightning can be an entire sonata. A thousand balls of lightning is a concert.. For this concert I have created a Ball Lightning, which can be heard on the icy peaks of the Himalayas. About Pythagoras and mathematics a scientist may not and must not infringe of these two. Numbers and equations are signs that mark the music of the spheres. If Einstein had heard these sounds, he would not create theories of relativity. These sounds are the messages to the mind that life has meaning, that the Universe exists in perfect harmony, and its beauty is the cause and effect of Creation. This music is the eternal cycle of stellar heavens. The smallest star has completed composition and also, part of the celestial symphony. The man’s heartbeats are part of the symphony on the Earth. Newton learned that the secret is in geometric arrangement and motion of celestial bodies. He recognized that the supreme law of harmony exists in the Universe. The curved space is chaos, chaos is not music. Einstein is the messenger of the time of sound and fury. Journalist: Mr. Tesla, do you hear that music? Tesla: I hear it all the time. My spiritual ear is as big as the sky we see above us. My natural ear I increased by the radar. According to the Theory of Relativity, two parallel lines will meet in infinity. By that Einstein’s curved will straighten. Once created, the sound lasts forever. For a man it can vanish, but continues to exist in the silence that is man’s greatest power. No, I have nothing against Mr. Einstein. He is a kind person and has done many good things, some of which will become part of the music. I will write to him and try to explain that the ether exists, and that its particles are what keep the Universe in harmony, and the life in eternity. Journalist: Tell me, please, under what conditions Angel adopt on the Earth? Tesla: I have ten of them. Keep good records vigilant. Journalist: I will document all your words, Dear Mr. Tesla. Tesla: The first requirement is a high awareness of its mission and work to be done. It must, if only dimly, exist in the early days. Let us not be falsely modest; Oak knows that it is oak tree, a bush beside him being a bush. When I was twelve, I have been sure I will get to Niagara Falls. For most of my discoveries I knew in my childhood that I will achieve them, although not entirely apparent … The second condition to adapt is determination. All that I might, I finished. Journalist: What is the third condition of adjustment, Mr. Tesla? Tesla: Guidance for all the vital and spiritual energies in labor. Therefore purification of the many effects and needs that man has. I therefore have not lost anything, but just gained. So I enjoyed every day and night. Write down: Nikola Tesla was a happy man… The fourth requirement is to adjust the physical assembly with a work.Journalist: What do you mean, Mr. Tesla? Tesla: First, the maintenance of the assembly. Man’s body is a perfect machine. I know my circuit and what’s good for him. Food what nearly all people eat, to me it is harmful and dangerous. Sometimes I visualize that chefs in the world are all in conspiracy against me … Touch my hand. Journalist: It was cold. Tesla: Yes. Bloodstream can be controlled, and many processes in and around us. Why are you frightened young man? Journalist: It’s a story that Mark Twain wrote a mysterious stranger, that wonderful book of Satan, inspired by you. Tesla: The word “Lucifer” is more charming. Mr. Twain likes to joke. As a child I was healed once by reading his books. When we met here and told him about, he was so touched that he cried. We became friends and he often came to my lab. Once he requested to show him a machine that by vibration provokes a feeling of bliss. It was one of those inventions for entertainment, what I sometimes like to do. I warned Mr. Twain as not to remain under these vibrations. He did not listen and stayed longer. It ended by being, like a rocket, holding pants, darted into a certain room. It was a diabolically funny, but I kept the seriousness. But, to adjust the physical circuit, in addition to food, dream is very important . From a long and exhausting work, which required superhuman effort, after one hour of sleep I’d be fully recovered. I gained the ability to manage sleep, to fell asleep and wake up in the time which I have designated. If I do something what I do not understand, I force myself to think about it in my dream, and thus find a solution. Tesla: The fifth condition of adjustment is memory. Perhaps in the most people, the brain is keeper of knowledge about the world and the knowledge gained through the life. My brain is engaged in more important things than remembering, it is picking what is required at a given moment. This is all around us. It should only be consumed. Everything that we once saw, hear, read and learn, accompanies us in the form of light particles. To me, these particles are obedient and faithful. Goethe’s Faust, my favorite book, I learned by heart in German as a student, and now it can all recite. I held my inventions for years ‘in my head “, and only then I realized them. Journalist: You often mentioned the power of visualization. Tesla: I might have to thank to visualization for all that I invented. The events of my life and my inventions are real in front of my eyes, visible as each occurrence or the item. In my youth I was frightened of not knowing what it is, but later, I learned to use this power as an exceptional talent and gift. I nurtured it, and jealously guarded. I also made corrections by visualization on most of my inventions, and finish them that way, by visualization I mentally solve complex mathematical equations. For that gift I have, I will receive rank High Lama in Tibet. My eyesight and hearing are perfect and, dare to say, stronger than other people. I hear the thunder of a hundred fifty miles away, and I see colors in the sky that others cannot see. This enlargement of vision and hearing, I had as a child. Later I consciously developed. Journalist: In youth you have several times been seriously ill. Is it a disease and a requirement to adapt? Tesla: Yes. It is often the result of a lack of exhaustion or vital force, but often the purification of mind and body from the toxins that have accumulated. It is necessary that a man suffers from time to time. The source of most disease is in the spirit. Therefore the spirit and can cure most diseases. As a student I got sick of cholera which raged in the region of Lika. I was cured because my father finally allowed me to study technology, which was my life. Illusion for me was not a disease, but the mind’s ability to penetrate beyond the three dimensions of the earth. I had them all my life, and I have received them as all other phenomena around us. Once, in childhood, I was walking along the river with Uncle and said: “From the water will appear the trout, I’ll throw a stone and it is cut.” That’s what happened. Frightened and amazed, his uncle cried: “Bade retro Satan’s!” He was an educated and he spoke in Latin … I was in Paris when I saw my mother’s death. In the sky, full of light and music floated are wonderful creatures. One of them had a mother’s character, who was looking at me with infinite love. As the vision disappeared, I knew that my mother died. Journalist: What is the seventh adjustment, Mr. Tesla? Tesla: The knowledge of how the mental and vital energy transform into what we want, and achieve control over all feelings. Hindus call it Kundalini Yoga. This knowledge can be learned, for what they need many years or is acquired by birth. The most of them I acquired by birth. They are in the closest connection with a sexual energy that is after the most widespread in the Universe. The woman is the biggest thief of that energy, and thus the spiritual power. I’ve always knew that and was alerted. Of myself I created what I wanted: a thoughtful and spiritual machine. Journalist: A ninth adjustment, Mr. Tesl Tesla: Do everything that any day, any moment, if possible, not to forget who we are and why we are on Earth. Extraordinary people who are struggling with illness, privation, or the society which hurts them with its stupidity, misunderstanding, persecution and other problems which the country is full of a swamps with insects, leaves behind unclaimed until the end of the work. There are many fallen angels on Earth. Journalist: What is the tenth adaptation? Tesla: It is most important. Write that Mr. Tesla played. He played the whole of his life and enjoyed it. Journalist: Mr. Tesla! Whether it relates to your findings and your work? Is this a game? Tesla: Yes, dear boy. I have so loved to play with electricity! I always cringe when I hear about the one also the Greek who stole fire. A terrible story about studding, and eagles peck at his liver. Did Zeus did not have enough lightning and thunder, and was damaged for one fervor? There is some misunderstanding… Lightning are the most beautiful toys that can be found. Do not forget that in your text stand out: Nikola Tesla was the first man who discovered lightning. Journalist: Mr. Tesla, you’re just talking about angels and their adaptation to the Earth. Tesla: Am I? This is the same. You could write this: he dared to take upon himself the prerogatives of Indri, Zeus and Peron. Imagine one of these gods in a black evening suit, with the bowler hat and wearing white cotton gloves prepares lightning, fires and earthquakes to the New York City elite! Journalist: Readers love the humor of our paper. But you confuse me stating that your findings, which have immense benefits for the people, representing the game. Many will frown on it. Tesla: Dear Mr. Smith, the trouble is that people are too serious. If they were not, they would be happier and much longer would have lived. Chinese proverb says that the seriousness reduces life. Visiting the inn Tai Pe guessed that he visits the Imperial Palace. But that the newspaper readers would not have frowned, let’s get back to things which they consider important. Journalist: They would love to hear what your philosophy is. Tesla: Life is a rhythm that must be comprehended. I feel the rhythm and direct on it and pamper in it. It was very grateful and gave me the knowledge I have. Everything that lives is related to a deep and wonderful relationship: man and the stars, amoebas’ and the sun, the heart and the circulation of an infinite number of worlds. These ties are unbreakable, but they can be tame and to propitiate and begin to create new and different relationships in the world, and that does not violate the old. Knowledge comes from space; our vision is its most perfect set. We have two eyes: the earthly and spiritual. It is recommended that it become one eye. Universe is alive in all its manifestations, like a thinking animal. Stone is a thinking and sentient being, such as plant, beast and a man. A star that shines asked to look at, and if we are not a sizeable self-absorbed we would understand its language and message. His breathing, his eyes and ears of the man must comply with breathing, eyes and ears of the Universe.Journalist: As you say this, it seems to me like I hear Buddhist texts, words or Taoist Parazulzusa. Tesla: That’s right! This means that there is general knowledge and truth that man has always possessed. In my feeling and experience, the Universe has only one substance and one supreme energy with an infinite number of manifestations of life. The best thing is that the discovery of a secret nature, reveals the other. One cannot hide, there are around us, but we are blind and deaf to them. If we emotionally tie ourselves to them, they come to us themselves. There are a lot of apples, but one Newton. He asked for just one apple that fell in front of him. Journalist: A question that might be set at the beginning of this conversation. What was Electricity for you, Dear Mr. Tesla? Tesla: Everything is Electricity. First was the light, endless source from which points out material and distribute it in all forms that represent the Universe and the Earth with all its aspects of life. Black is the true face of Light, only we do not see this. It is remarkable grace to man and other creatures. One of its particles possesses light, thermal, nuclear, radiation, chemical, mechanical and an unidentified energy. It has the power to run the Earth with its orbit. It is true Archimedean lever. Journalist: Mr. Tesla, you’re too biased towards electricity. Tesla: Electricity I am. Or, if you wish, I am the electricity in the human form. You are Electricity; too Mr. Smith, but you do not realize it. Journalist: Is it thus your ability to allow fails of electricity of one million volts trough your body? Tesla: Imagine a gardener who is attacked by herbs. This would indeed be crazy. Man’s body and brain are made from a large amount energy; in me there is the majority of electricity. The energy that is different in everyone is what makes the human “I” or “soul”. For other creatures to their essence, “soul” of the plant is the “soul” of minerals and animals. Brain function and death is manifested in light. My eyes in youth were black, now blue, and as time goes on and strain the brain gets stronger, they are closer to white. White is the color of heaven. Through my window one morning, landed a white dove, which I fed. She wanted to bring me a word that she was dying. From her eyes the light jets were coming out. Never in the eyes of any creature had I not seen so much light, as in that pigeon. Journalist: Personnel in your lab speak about flashes of light, flames and lightning that occur if you are angry or into kind of risk. Tesla: It is the psychic discharge or a warning to be alert. The light was always on my side. Do you know how I discovered the rotating magnetic field and induction motor, which made me became famous when I was twenty-six? One summer evening in Budapest, I watched with my friend Sigetijem sunset. Thousands of fire was turning around in thousands of flaming colors. I remembered Faust and recited his verses and then, as in a fog, I saw spinning magnetic field, and induction motor. I saw them in the sun! Journalist: Hotel service telling that at the time of lightning you isolate into the room and talk to yourselves. Tesla: I talk with lightning and thunder. Journalist: With them? What language, Mr.Tesla? Tesla: Mostly my native language. It has the words and sounds, especially in poetry, what is suitable for it. Journalist: Readers of our magazine would be very grateful if you would interpret that. Tesla: The sound does not exist only in the thunder and lightning, but, in transformation into the brightness and color. A color can be heard. Language is of the words, which means that it is from the sounds and colors. Every thunder and lightning are different and have their names. I call some of them by the names of those who were close in my life, or by those whom I admire. In the sky brightness and thunder live my mother, sister, brother Daniel, a poet Jovan Jovanovic Zmaj and other persons of Serbian history. Names such AsIsaiah, Ezekiel, Leonardo, Beethoven, Goya, Faraday, Pushkin and all burning fires mark shoals and tangles of lightning and thunder, which does not stop all night bringing to the Earth precious rain and burning trees or villages. There is lightning and thunder, and they are the brightest and most powerful, that will not vanish. They are coming back and I recognize them among the thousands. Journalist: For you, science or poetry is the same? Tesla: These are the two eyes of one person. William Blake was taught that the Universe was born from the imagination, that it maintains and it will exist as long as there is a last man on the Earth. With it was a wheel to which astronomers can collect the stars of all galaxies. It is the creative energy identical to the light energy. Journalist: Imagination is more real to you than life itself? Tesla: It gives birth to the life. I have fed by my taught; I’ve learned to control emotions, dreams and visions. I have always cherished, as I nurtured my enthusiasm. All my long life I spent in ecstasy. That was the source of my happiness. It helped me during all these years to bear with work, which was enough for the five lives. The best is to work at night, because the stellar light, and close bond. Journalist: You said that I am, like every being, the Light. This flatter me, but I confess, I do not quite understand. Tesla: Why would you need to understand, Mr. Smith? Suffice it to believe it. Everything is light. In one its ray is the fate of nations, each nation has its own ray in what great light source we see as the sun. And remember: no one who was there did not die. They transformed into the light, and as such exist still. The secret lies in the fact that the light particles restore their original state. Journalist: This is the resurrection! Tesla: I prefer to call it: return to a previous energy. Christ and several others knew the secret. I am searching how to preserve human energy. It is forms of Light, sometimes straight like heavenly light. I have not looked for it for my own sake, but for the good of all. I believe that my discoveries make people’s lives easier and more bearable, and channel them to spirituality and morality. Journalist: Do you think that time can be abolished. Tesla: Not quite, because the first feature of the energy is that it transforms. It is in perpetual transformation, as clouds of Taoists. But it is possible to leverage the fact that a man preserves consciousness after the earthly life. In every corner of the universe exist energy of life; one of them is immortality, whose origin is outside of man, waiting for him. The universe is spiritual; we are only half that way. The Universe is more moral than us, because we do not know his nature and how to harmonize our lives with it. I am not scientist, science is perhaps the most convenient way to find the answer to the question that always haunt me, and which my days and nights turned into fire. Journalist: What’s the matter? Tesla: How are your eyes brightened!… What I wanted to know is: what happens to a falling star as the sun goes out? Stars fall like dust or seed in this or in other worlds, and the sun be scattered in our minds, in the lives of many beings, what will be reborn as a new light, or cosmic wind scattered in infinity. I understand that this is necessary included in the structure of the Universe. The thing is, though, is that one of these stars and one of these suns, even the smallest, preserves. Journalist: But, Mr. Tesla, you realize that this is necessary and is included in the constitution of the world! Tesla: When a man becomes concuss; that his highest goal must be to run for a shooting star, and tries to capture it; shall understand that his life was given to him because of this and will be saved. Stars will eventually be capable to catch! Journalist: And what will happen then? Tesla: The creator will laugh and say: ”It fall only that you chase her and grab her.” Journalist: Isn’t all of this contrary to the cosmic pain, which so often you mention in your writings? And what is it cosmic pain? Tesla: No, because we are on Earth … It is an illness whose existence the vast majority of people are not aware of. Hence, many other illnesses, suffering, evil, misery, wars and everything else what makes human life an absurd and horrible condition. This disease cannot be completely cured, but awareness shall make it less complicated and hazardous. Whenever one of my close and dear people were hurt, I felt physical pain. This is because our bodies are made as of similar material, and our soul related with unbreakable strands. Incomprehensible sadness that overwhelmed us at times means that somewhere, on the other side on this planet, a child or generous man died. The entire Universe is in certain periods sick of itself, and of us. Disappearance of a star and the appearance of comets affect us more than we can imagine. Relationships among the creatures on the Earth are even stronger, because of our feelings and thoughts the flower will scent even more beautiful or will fall in silence.These truths we must learn in order to be healed. Remedy is in our hearts and evenly, in the heart of the animals that we call the Universe. New York American — July 6, 1930. When a child is born its sense-organs are brought in contact with the outer world. The waves of sound, heat, and light beat upon its feeble body, its sensitive nerve-fibres quiver, the muscles contract and relax in obedience: a gasp, a breath, and in this act a marvelous little engine, of inconceivable delicacy and complexity of construction, unlike any on earth, is hitched to the wheel-work of the Universe. The little engine labors and grows, performs more and more involved operations, becomes sensitive to ever subtler influences and now there manifests itself in the fully developed being - Man - a desire mysterious, inscrutable and irresistible: to imitate nature, to create, to work himself the wonders he perceives. Inspired in this task he searches, discovers and invents, designs and constructs, and enriches with monuments of beauty, grandeur and awe, the star of his birth. He descends into the bowels of the globe to bring forth its hidden treasures and to unlock its immense imprisoned energies for its use. He invades the dark depths of the ocean and the azure regions of the sky. He peers into the innermost nooks and recesses of molecular structure and lays bare to his gaze worlds infinitely remote. He subdues and puts to his service the fierce, devastating spark of Prometheus, the titanic forces of the waterfall, the wind and the tide. He tames the thundering bolt of Jove and annihilates time and space. He makes the great Sun itself his obedient toiling slave. Such is the power and might that the heavens reverberate and the whole earth trembles by the mere sound of his voice. What has the future in store for this strange being, born of a breath, of perishable tissue, yet immortal, with his powers fearful and divine? What magic will be wrought by him in the end? What is to be his greatest deed, his crowning achievement? Long ago he recognized that all perceptible matter comes from a primary substance, of a tenuity beyond conception and filling all space - the Akasha or luminiferous ether - which is acted upon by the life-giving Prana or creative force, calling into existence, in never ending cycles, all things and phenomena. The primary substance, thrown into infinitesimal whirls of prodigious velocity, becomes gross matter; the force subsiding, the motion ceases and matter disappears, reverting to the primary substance. Can Man control this grandest, most awe-inspiring of all processes in nature? Can he harness her inexhaustible energies to perform all their functions at his bidding, more still - can he so refine his means of control as to put them in operation simply by the force of his will? If he could do this he would have powers almost unlimited and supernatural. At his command, with but a slight effort on his part, old worlds would disappear and new ones of his planning would spring into being. He could fix, solidify and preserve the ethereal shapes of his imagining, the fleeting visions of his dreams. He could express all the creations of his mind, on any scale, in forms concrete and imperishable. He could alter the size of this planet, control its seasons, guide it along any path he might choose through the depths of the Universe. He could make planets collide and produce his suns and stars, his heat and light. He could originate and develop life in all its infinite forms. To create and annihilate material substance, cause it to aggregate in forms according to his desire, would be the supreme manifestation of the power of Man’s mind, his most complete triumph over the physical world, his crowning achievement which would place him beside his Creator and fulfill his ultimate destiny.